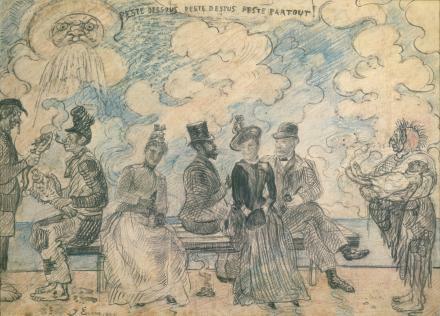 'Prince of painters,‘ forerunner of Surrealism, yet more kindred to Brueghel and Goya: 2010 is the 150th anniversary of the birth of James Ensor. This is an ideal occasion for ING, in co-production with the Royal Museum of Fine Arts Antwerp (KMSKA) and the Centre for Fine Arts—BOZAR to get to the core of the life of the prolific artist. Ensor was not only a creative genius, but also a troubled personality, with equally strong fascination for light as for death. For this exceptional project, the largest Ensor collection in the world moves nearly complete to the ING Cultural Centre in Brussels. It involves the invaluable collection of the KMSKA, which closes its doors in 2011 for a thorough renovation. This Antwerp collection contains more than 30 paintings and 150 drawings, complemented with dozens of photographs and personal documents that have previously never been released. An unexpected view, open and exposed, on the secrets of a child with a head full of dreams who grew up to be a prominent artist. Finally, Ensor unmasked!